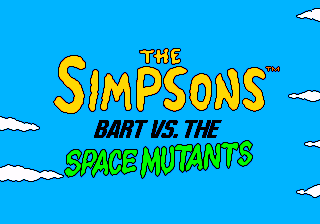 The Simpsons: Bart vs. the Space Mutants is a video game developed and published by Acclaim, and the first game ever to carry The Simpsons franchise. It first appeared in 1991, and was subsequently ported to most home platforms of the day, including the Sega Mega Drive, Sega Master System and Sega Game Gear. Built very early in the show's run, the game sees Bart attempting to stop "Space Mutants" by disposing of items they wish to use to power their machines and uncovering enough evidence to prove the aliens exist. Reviews have been mixed due to high level of difficulty. It also did not have the rights to use The Simpsons' theme. Bart vs. the Space Mutants was followed by Bart vs. the World. Game Design by: Imagineering Inc.
Main article: The Simpsons: Bart vs. the Space Mutants/Magazine articles. Main article: The Simpsons: Bart vs. the Space Mutants/Promotional material.